A simple, clear and common sense course providing an in-depth working knowledge of Ayurveda which you can easily apply to your life to stay healthy, calm and balanced in this 21st century world. Learn how to maintain a high level of health and manage disease. Discover who you are and how simple changes can radically uplift and improve your whole life experience. Everything outside of us affects what goes on inside—the food we eat, the supplements we take, the seasons, the environment, the type of exercise we do and the therapies we receive. All of these influences have a particular type of impact on your body, mind and emotions. As you understand yourself better, you will notice how your health, relationships and quality of life improves. According to the ancient healing science of Ayurveda, every living and non-living thing in the Universe is made up of a combination of 5 basic elements – Space, Air, Fire, Water and Earth. Our human body is also made up of these 5 elements in various compositions. They manifest in the human body as 3 basic principles or subtle energies known as doshas: Vata, Pitta and Kapha. This is why everything outside of us can affect what goes on inside of us. We can be so affected by the food we eat, the herbs or supplements we take, what we drink, the seasons of the year, the environment around us, even what type of exercise we do and therapies we have, have a particular type of impact on our body, mind and emotions. Knowledge of the 5 elements and the 3 doshas is essential in order to lead happy and healthy lives. When they are in balance, we are able to function at our highest level as human beings. By understanding the positive and negative aspects of each element and dosha, we can design our life in such a way that we can live the life we want to—healthy, happy and fulfilled. 01372 725327 or email london@druworldwide.com. "A very fascinating course. What we have learned in just 2 days can certainly transform our lives! Escellent teaching; I'm inspired and empowered to implement this healing science. BRILLIANT!!" 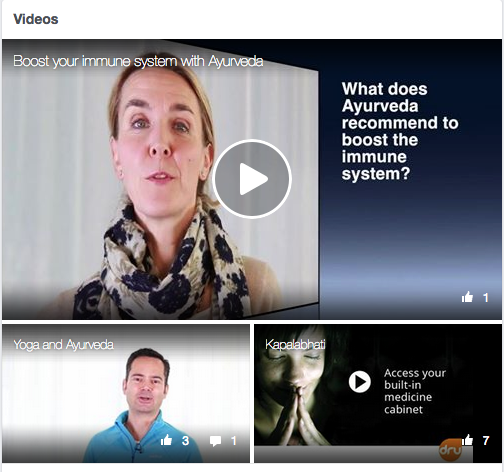 There's plenty to see and loads of insights to be had at our Ayurveda facebook page, do have a look! We hope you are enjoying this training course and are looking forward to furthering your experience and knowledge as the course progresses. The whole experience is second to none as you get the opportunity of meeting and liaising with the Dru teacher training team, gaining much from their invaluable expertise and knowledge. You are also able to ask any questions you may have and tap into their expert knowledge and insight as you go through the training sessions. You also get the chance to meet other like-minded people who are on their learning journey with you, forging life-long friendships and companions. Once your training course has finished there are always retreats you can attend - just for yourself to have some 'time out'. Of course, once this is necessary, there are CPD courses you can attend too. You may also find that you wish to continue your learning and take up another teacher training course. All the details of these courses are constantly being added to the Dru Yoga website.